BATON ROUGE, La. (CNS) — As tragic events have unfolded in the Baton Rouge area, the Catholic community has been at the forefront of helping to spread the message of peace. From holding prayer services to opening churches to hosting community meetings, Catholic leaders have been involved in every step to reconcile community members in the wake of the police shooting of Alton Sterling in the early morning of July 5 and the shooting of three law enforcement officials July 17. 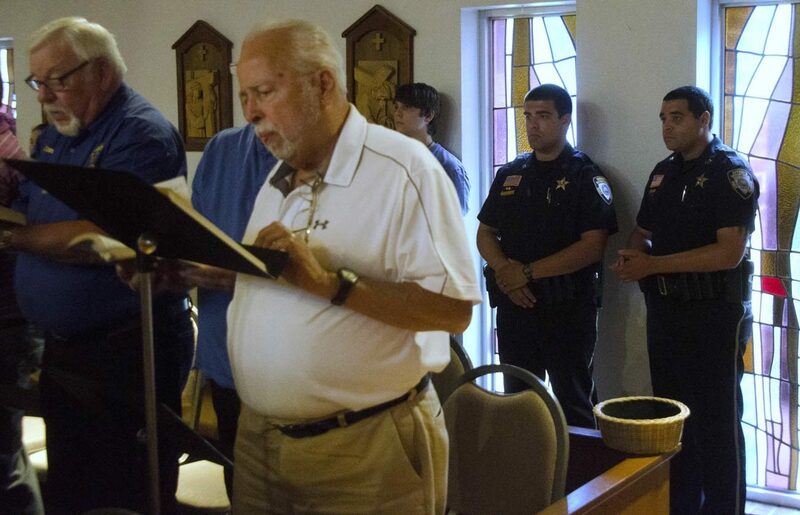 “I thought coming together in the presence of God and showing our love and support was the right thing to do,” said Father Jeff Bayhi, pastor of St. John the Baptist Church in Zachary, where a prayer service July 17 attracted community members from all races and religious beliefs. A prayer service also was held at St. Gerard Majella Church in Baton Rouge July 17. In the days following the death of Sterling, St. Aloysius Church in Baton Rouge held an emotional prayer service that also drew a large crowd. At times, Father Randy Cuevas, pastor, succumbed to the tears he had been fighting as he read a message from Father Josh Johnson, parochial vicar, who is the only African-American priest in the Baton Rouge Diocese. Also, shortly after the shooting, St. Paul’s Church in Baton Rouge hosted a “Together Baton Rouge” meeting, which drew several hundred people. “Hope swells (because) of a deeply imbedded faith passed down in the black community generation to generation in the most difficult of times: post slavery, Jim Crow, fight for civil rights, fight for voting rights. It’s that faith, that immersion of self-determination that has allowed us not to give up but to press on even in the most painful, difficult time,” said Father Andrus. In recent weeks, Catholic leaders have repeatedly issued calls for peace, even during tense standoffs between police and protesters at police headquarters and the site where Sterling was shot. Peace appeared to reign until two Baton Rouge Police officers and an East Baton Rouge sheriff’s deputy were killed at a business off a local highway. “God is faithful, and because of that, I believe God is (here) in the midst of this confusion and chaos,” said Father Tom Ranzino, diocesan vicar general and pastor of St. Jean Vianney Parish in Baton Rouge. “If I can look above the conflict and see the pattern in suffering and death, we see that Christ is here. While celebrating Mass on the evening of the police shootings, Father Johnson once again addressed racial tensions and violence during his homily. For Father Johnson, the issue, on the surface, could appear to be a conflict between his African-American heritage and his own faith — especially compounded by the fact his father is a former Baton Rouge police officer. But he finds solace in his own spirituality and commitment to a prayerful life. “The authentic Catholic response is to pray and fast,” Father Johnson added. “From there we open ourselves up to hear what God wants us to do next. This is an invitation from the Lord to drop to our knees and consult with the Lord to see what he wants us to do to bring about dialogue with people who are different than us. The Rev. Stephen Byrd, who is pastor at First Baptist Church in Zachary, was among pastors from throughout the community who joined Father Bayhi to preach the message of hope and peace. Meek is editor and general manager of The Catholic Commentator, newspaper of the Diocese of Baton Rouge.